Codependency is most often the result of childhood trauma. But many readers have written to me, confused because they’re codependent and had a “normal” childhood. The concept of codependency originated in the 1970’s when substance abuse professionals recognized that not only are alcoholics profoundly affected by their addiction, but so are their families. Over the years, we’ve realized that codependent traits and relationship patterns extend well beyond families impacted by addiction. Chronic mental or physical illness, spousal and child abuse, and other family dysfunctions can lead to similar family dynamics and codependency. Before we continue, let’s do a quick review of the most common codependent traits. And remember that codependency exists on a spectrum, so you can have some or all of these traits to varying degrees. Not all codependents grew up in a dysfunctional or toxic family. You may recall having a “normal” or “good” childhood. Your parents didn’t get drunk and beat you. You didn’t live in fear. You had friends over and could relax and play. By all accounts, your childhood was fairly normal. Codependency develops as a response to trauma, but that trauma didn’t necessarily happen to you. It could have been several generations in the past (for example, an alcoholic grandparent or mentally ill great grandparent). Codependent behaviors and thought patterns are learned. If you’re a codependent who didn’t grow up with active addiction or mental illness in your household, there’s a good chance that one or both of your parents is also codependent. The unspoken rules of codependent families include, “We don’t talk about our problems” and “We don’t have any problems. Everything’s fine.” So, it’s no surprise that you might not even know about Grandpa’s alcoholism or Great Grandma’s Bipolar Disorder and how that impacted your parents and grandparents. Codependent patterns continue even after the addict or mentally ill person gets treatment, leaves the family, or dies. In other words, codependency doesn’t go away when you divorce your husband or when your adult child gets sober. Codependency is deeply entrenched and needs its own treatment. 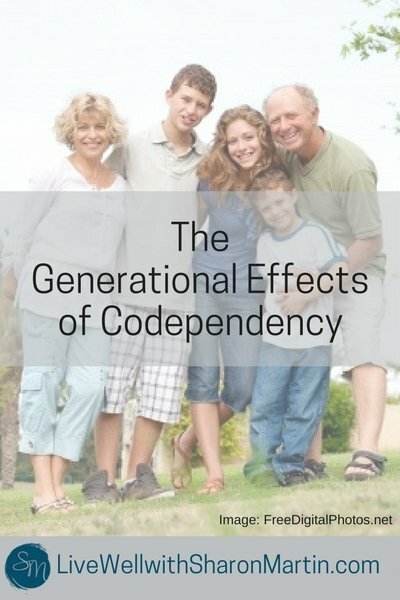 How is codependency passed down generationally? Because codependency is learned, parents unknowingly model and teach their children codependent ways of thinking and acting. For example, if your mother was repeatedly scolded for crying and praised for watching her siblings and cleaning up after her father’s drunken rages, she will learn to be an overly responsible caregiver who denies her own feelings and needs in order to please others. And because her parents weren’t interested in her feelings, she didn’t learn to notice, value, and express her feelings. She may unintentionally teach you the same thing when she fails to notice your feelings and attend to them, never asks your opinion, and has unrealistic expectations of you. Or your mother may have modeled and taught you that you need to be “good”, do as you’re told, do for others even if it hurts you, and keep your problems to yourself. To avoid passing codependency down to your children, it’s important to heal yourself. It can be helpful to identify your own codependent traits and think about how you can actively teach your child to think, feel, and act differently. Here are some tips that may be helpful. Educate yourself about codependency. 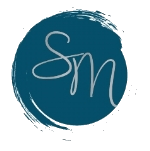 Codependent No More by Melody Beattie, Grandchildren of Alcoholics by Ann Smith, and It Will Never Happen to Me by Claudia Black are all great resources. And there are many great blogs available free online, such as the one I write on PsychCentral. Take care of yourself. Self-care is crucial for your wellbeing and it shows your children that we all have needs and we deserve to treat ourselves with kindness. Set boundaries with your family of origin and others. Boundaries tell others how they can treat us. Practice standing up for yourself and letting people know what you’re willing to do (and say “no” to the rest). Ask for help. You probably want to do everything yourself, but this leads to burnout, isolation, and resentment. Help can be calling a local resource or a The National Domestic Violence Hotline (1-800-799-7233) if you’re being abused. Or it can be asking a friend to babysit. Or it can be asking your partner to help with some household chores. Most importantly, know that it’s not realistic or healthy to try to do it all by yourself. Use healthy communication skills. Be on the lookout for unhealthy patterns such as guilt trips, manipulating, and passive-aggressive behavior. Instead practice healthy communication, such as using “I statements”. Be authentic and imperfect in your relationships. Allow others to see the imperfect parts of yourself, your struggles, your true feelings and opinions. When you stop pretending that “everything’s fine”, you can create deeper relationships and dispel fears of rejection. Share your story with trusted people. Codependency feels shameful for most people, so they keep it a secret. However, secrets tend to breed shame. Freedom comes when you share your story and receive understanding and empathy. It’s imperative that you’re selective in who you share with, however. Often a therapist or support group is a good place to start. Some things can be shared with your children in an age-appropriate way (often it helps to get guidance on what is appropriate given your particular circumstances). Parenting support and education. Parenting is hard, hard, hard! It challenges us in ways that nothing else does. If you’re raising children, seek out a support system. Again, look for people you can be real with; you need people you feel safe to share your screw ups and frustrations with. Enlisting the help of your child’s pediatrician, teacher, parenting educator, or therapist can also be very helpful in learning some of the nuances of setting age-appropriate expectations, rules, and consequences. Treat yourself with compassion. Try to be more kind, accepting, and forgiving of yourself. You aren’t perfect and neither is anyone else. By changing self-critical statements like “I’m such an idiot” to “We all make mistakes sometimes”, you’re teaching your kids that mistakes don’t define people and that their value extends beyond their accomplishments. For more codependency support, my e-book Navigating the Codependency Maze is a compassionate approach to healing codependency using the same exercises that I use in my psychotherapy practice. Get your copy today! ©2017 Sharon Martin, LCSW. Do not reprint without permission. Yes, focus of you….because you matter! excellent article. the unhealthy communication patterns are very common. only i tellect & arguement was valued…in my family of origin two successful educated parents who criticized & sarcastic & dismissive saw feelings as signs of weakness. I felt a failure my whole life until finding a good therapist! fantastic article! very true for me, I am on a healing journey and finally starting to thrive because of wonderful articles like this one! thank you! Thanks, Tami. I’m glad it was helpful!